Censored websites and internet kill switches are just a couple of possibilities. On January 29, 2018 Futurism reported that the Trump administration had plans to build its own 5G network. According to documents initially acquired by Axios, the administration would both pay for and build the network itself. The 5G network would serve to safeguard the country against China’s suspected ability to spy on phone calls placed in the United States. According to Axios, it would still be another six to eight months before President Trump would be able to sign off on such a plan. But only hours after Axios revealed the plan, government officials like Ajit Pai, Chairman of the Federal Communications Commission (FCC), spoke out against a government-run 5G network. “Any federal effort to construct a nationalized 5G network would be a costly and counterproductive distraction from the policies we need to help the United States win the 5G future,” Pai said in a statement. However the discussion surrounding the Trump Administration’s prematurely revealed plans may be moot, as Recode — citing multiple White House officials — reports the documents detailed by Axios are outdated. Those officials asserted that the U.S. government is not actively seeking to construct and control its own 5G network. “[The White House officials] also stressed it had merely been floated by a staff member, not a reflection of some imminent, major policy announcement — and probably might never be,” wrote Recode’s Tony Romm. Still, as Recode noted, the very existence of the documents reveals just how concerned President Trump and some of his aides are when it comes to China stealing sensitive information from the U.S. And while the White House has said there’s nothing in the works pertaining to a 5G network, the idea is now out there, and people are free to speculate what the impacts such a network would have on American citizens and society. 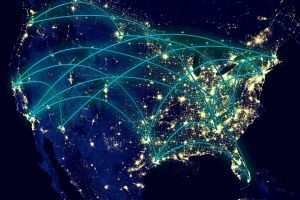 If the Trump Administration followed through on these now outdated plans, it would represent an unprecedented shift in the industry, as U.S. telecommunications have been largely private up to this point. One of the main reasons to repeal net neutrality, was to free the internet from existing government regulations — despite the benefits that federal oversight provides, and concerns over its impending absence. As Business Insider points out, if a government-controlled network existed, wireless companies would need to rent the right to broadcast network signals and rent the technology to do so. It’s possible these sudden rental costs would be reflected in the monthly costs people pay for mobile networks and internet speeds. To get a sense of what living with a government-controlled network would be like, though, we can look at how other nations handle mobile internet plans. According to Slate, the European Union (EU) and countries like Guatemala restrict certain apps to specific mobile internet plans and SIM cards. In Portugal, though the country is bound by the EU’s net neutrality rules, there are various pricing schemes based on users’ app preferences. One of the more extreme cases that could happen under a government-controlled 5G network would be the government’s ability to cut off the internet. The Department of Homeland Security (DHS) once had plans for a “kill switch” that was revealed to the public in 2013. As reported by Mother Jones, the plan would allow the government to “disconnect commercial and private wireless networks… in the event of an emergency, such as a viable threat of a terrorist attack.” The DHS has not followed through on those plans in the last five years. While it might be beneficial to have a kill switch in place, it’s easy to imagine a situation in which networks were disconnected by accident, similar to the recent missile warning that mistakenly went out in Hawaii. Ultimately, though, concerns about the consequences of a government-run network might be academic. If Recode’s sources in the White House are correct, we won’t have to worry about the government controlling cellular and internet connections. That said, the U.S. telecommunications landscape could change drastically in the coming years if net neutrality isn’t restored. Service providers in a non-neutral internet setting that can dictate how fast certain sites load and how much you have to pay for them, may seem relatively inconsequential compared to the idea of a wholly government-run network. But both portend significant changes to how U.S. citizens might interact with the internet, and the future of the telecommunications industry. You’re Not Crazy if You Believe in UFOs. Let’s Discuss in Scientific Terms. Are Engineers Responsible for the Consequences of Their Algorithms?